The image of Cologne that has resonated most with me is the aerial shot of the devastated Old Town, a victim of Allied bombing during World War II. Amid the wrecked shells of thousands of buildings and the collapsed bridges now piles of debris blocking the Rhine River, the Cologne Cathedral remains standing despite being hit dozens of times. This formidable building took more than 600 years to complete, and I had to see the structure that miraculously survived such an onslaught. 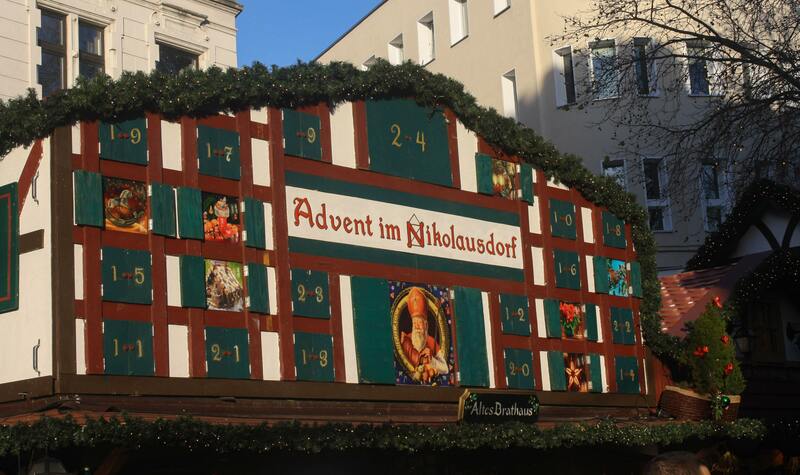 A stall’s Advent calendar builds the anticipation of the arriving holiday. The hauptbahnhof opens onto the same platz as one side of the church, and I was immediately awed by its size. Begun in 1248 and not completed until 1880 after a long work halt, it remains the largest Gothic church in Northern Europe, has its second-tallest spires (reaching up 515 feet), and claims to have the largest façade of any church in the world. At 474 feet long and 283 feet wide, the building takes up 85,186 square feet. Its treasured inventory includes gorgeous mosaic floors, tons of statuary, an altar from 1355 and a high altar from 1310, the largest choir stall in Germany, the oldest known large crucifix (10th century), a medieval statue of St. Christopher, the Shrine of the Three Kings (believed to contained their relics), and over 107,000 square feet of gorgeous windows, including stained glass from as far back as 1265. I could have spent so much more time here than the 90 minutes that I did, but Christmas and chocolate were calling me. Does it get any more romantic than this? 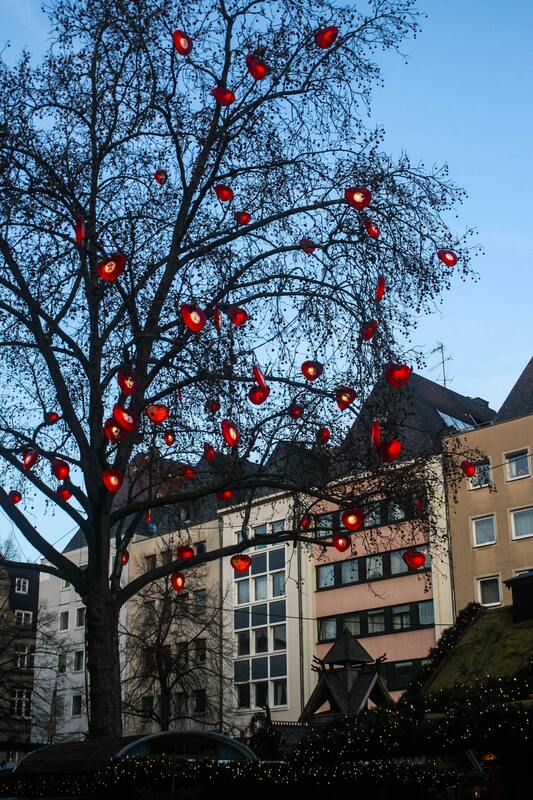 Cologne was a bit of a Johann-come-lately to the Christmas market scene in Germany. Its oldest market first popped up in 1820, but after 65 years, local authorities banned it due to an overabundance of stands and rowdy revelers. The market didn’t return until almost a century later, in the 1970s, followed by another in the 1990s and smaller markets around the turn of the century. I wondered how they would fare when compared to the older, long-established markets I had enjoyed so far. The first market I came to was the Nikolausdorf (St. Nicholas Village), occupying the Rudolfplatz in the shadow of the Hahnentorburg, the old gate from the early 13th century, rebuilt after the war. A couple of two-story gates marked the entrance to this especially attractive market, where the stalls were designed like half-timber houses, one with an enormous Advent calendar on its gable, ticking down the days until Christmas. Festive wind chimes tinkled in the soft breeze. Nutcrackers ranging in size from a small Christmas tree ornament to a small child stood in orderly rows waiting to be purchased — mostly soldiers, but when I looked more closely, I also spotted Scottish drummers wearing kilts, and chefs holding spatulas and clad in red-and-white checkered aprons. Just a few blocks from there, past the Basilika St. Aposteln (Basilica of the Holy Apostles), a striking Romanesque church from the 13th century with an octagonal dome, I came to the Markt der Engel (Angel’s Market), occupying the entire Neumarkt square and emerging as the prettiest market I had seen. As the name implies, hosts of angels both decorated the vendors’ chalets and stood ready to be purchased in all sorts of media. Stands selling glühwein bore such heavenly names as “Cloud Nine” and “Gabriel’s.” Although they were the pronounced motif here, these supernal beings didn’t hold a monopoly — moose, gnomes, reindeer, and other Christmas and winter figures embellished the stalls, all trimmed with garlands of green. White stars dangled from bare, patulous tree branches that formed a canopy over the market. Mounds of roasted mandeln (almonds) and other nuts stirred my appetite, and a bag of them found itself in my hands for a snack later on as I munched on a pretzel baked with cheese. 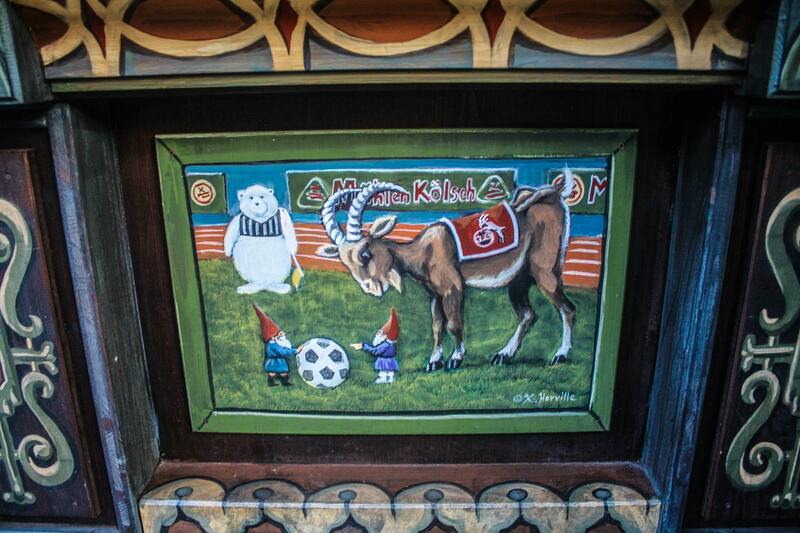 In the Heimat der Heinzel (“Home of the Elves”), keep an eye out for these little guys all around you. Reluctantly, I tore myself away and circled around the impressive City Hall, with its wonderful tower from 1414, a lovely loggia from 1573, and a façade populated by about 130 finely sculpted stone statues of people who made a significant impact on the history of Cologne over the course of 2,000 years — kings, archbishops, emperors, dukes, merchants, theologians, town clerks. Practically demolished during World War II, the 13th-century Groß Sankt Martin (Great St. Martin Church) today remains a key building in the Cologne skyline, marked by a soaring tower cornered by four circular towers that led me back to the Rhine River on my way to the Schokoladenmuseum (Chocolate Museum), opened in 1993. Chocolate lovers like me from around the world flocked to this place to experience the museum’s comprehensive exhibit on the story of chocolate — its history, manufacture, and place in society and culture; the artful tin boxes and dispensing machines it was sold in; a re-created chocolate shop; and a small Lindt factory handing out free samples. The large gift shop, stocked with all kinds of chocolate from around the world, relieved me of countless euro — and I was never so content to part with hard-earned cash. Just steps away from the museum, I stumbled upon the small Harbor Christmas Market. But time was escaping me, and two more markets still remained, so I gave it only a quick perusal before walking to the Christmas Market on the Alter Markt (Old Market). The main entrances welcomed visitors to pass between four-tiered ziggurat towers with Gothic windows and into the Heimat der Heinzel (Home of the Elves) — the first indication that this large market would be a little bit quirky. It didn’t take me long to start noticing the elves everywhere — standing on the roofs of the chalets; featured in the design of the signs for the flammlachs (“flamed salmon”) stall, roasting some fish over an open fire, and for the crêperie, standing behind a crêpe three times its size; riding in the ski lift over the ice-skating rink; and, my favorite, on a sign at a food stall, posing as the Three Wise Men, on their way to Bethlehem from Cologne, toting — instead of gold, frankincense, and myrrh — a beer, a pie, and a sausage (which may never reach its destination, given the expression of its carrier, with his tongue smacking his lips). 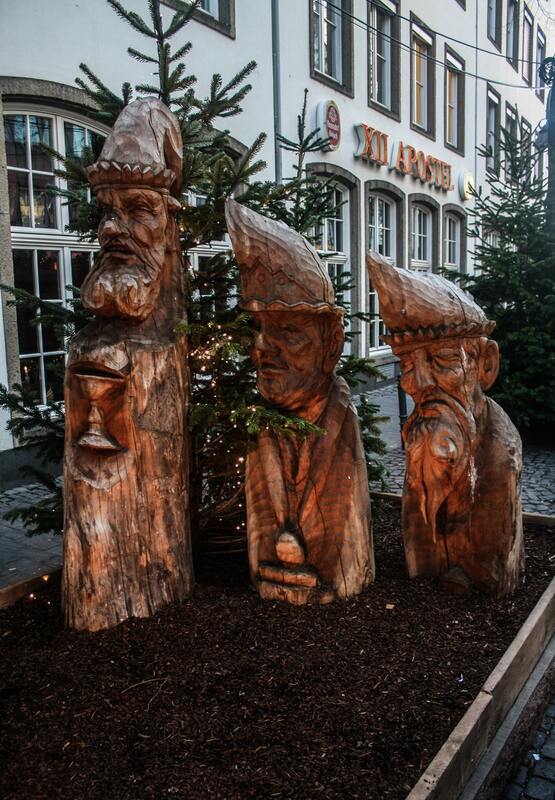 The Three Kings are just part of a greater Nativity hand-carved into logs. I wondered if the elves here all seemed so happy because of all the alcoholic drinks available. A polar bear holding a tray crowded with full beer mugs enticed people over to order up a Mühlen Kölsch, a top locally fermented beer. A two-story chalet overlooking the ice-skating rink sold feuerzangenbowle, a drink that involves igniting a rum-soaked sugarloaf and letting it melt into red wine. A structure bearing a pronounced likeness to a Norwegian stave church, including dragon heads at the top of the roof peaks, seemed anomalous to a German market, until I noticed that it was selling glögg, a Nordic version of glühwein, occasionally spiked with vodka, brandy, or akvavit. An owl acting as the column of one of the stalls looked like he’d already had one too many, his eyes complacently at half-mast. Of course, alcohol wasn’t the only thing for sale. Among the Christmas items I had been seeing in most cities, this market also offered galettes, leather belts, marzipan, thick wool socks, and logs carved into ducks and pigs that you can scatter around your yard. A feast for my eyes hung above me: chandeliers with tall battery-operated candles and trimmed with yellow lights; wreaths cluttered with candy canes and gift-wrapped boxes; and red hearts with white circular centers. In the evening’s gloaming, a gorgeous warm glow enveloped the entire market. I felt a little blue as I left this market, knowing the next one I was heading to would be my last, and soon it would be time to leave this land of holiday magic. But the unusual Nativity leading out of the market wiped away that little bit of sadness as I marveled at the talents of whomever created the scene: logs carved into partial figures of all the key players set in a couple of boxed beds of mulch. By the time I caught my first glance of the Cathedral Christmas Market, my good cheer returned, and I felt like an excited child on the morning of December 25. With the gorgeous silhouette of the cathedral as a backdrop, the market’s lights seemed to glow even more powerfully against the deep blue sky of early night. The Christmas tree dominated the scene — a Nordmann fir towering more than 80 feet above the market and drenched with 50,000 LED lights. Luminous stalls fanning out from the tree provided seemingly endless quantities of snow globes, luxurious shawls, blown-glass vases and plates, wreaths of pine cones and holly, and hand-carved cheeseboards, pencil holders, and miniature Christmas pyramids. 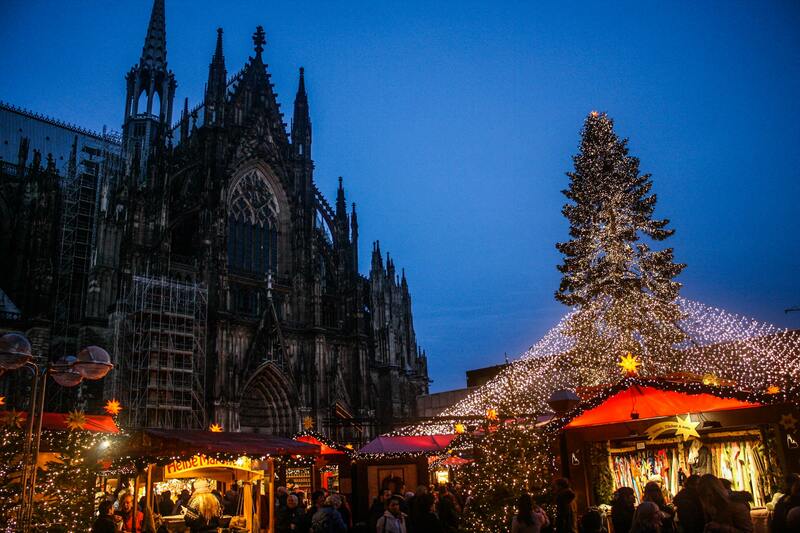 With the stunning Cologne Cathedral in the background, the Cathedral Christmas Market at night makes you feel like a child all over again. The performance stage, with its red curtain, two Christmas trees, spiky stars, and vertical strands of red and white lights, suddenly came alive with a four-man band. I purchased a nusstrudel (nut strudel) with warm vanilla sauce and stopped to listen to the music, recognizing some of the tunes but none of the words. The night air had chilled by the time the band completed its first set, justly rewarded by appreciative applause from the audience, and I knew it was time to take my leave. As my train back to Frankfurt pulled out of the hauptbahnhof and crossed over the Rhine via the famous Hohenzollernbrücke, I leaned back in my seat, some bags of gifts cluttered at my feet, and reflected upon my week here. It had been a remarkable experience, one of total immersion into a foreign culture that didn’t care if I was unfamiliar with its foods and local wonts, if I couldn’t pronounce some of the sesquipedalian words, or if I wrote “Cologne” instead of “Köln.” People of all ages and backgrounds, whether they lived down the street or halfway around the world, had fused into one happy global village, and for seven days, my annual belief that it’s possible to achieve world peace — ephemeral as it always seems to be — was restored. As I disembarked the train in Frankfurt, I had an epiphany that warmed my heart: I had received my Christmas gifts and blessings early this year. And Santa had been very generous, indeed.